Despite rocky relationship with Naftali Bennett, Ya'alon doesn't rule out merging with the New Right, says Likud MKs want him back. Despite his historically rocky relationship with Naftali Bennett, former Defense Minister Moshe 'Bogie' Ya'alon didn't rule out merging his 'Telem' party with Bennett's New Right. Ya'alon's comments came during a sit-down he held with journalists on Thursday afternoon. 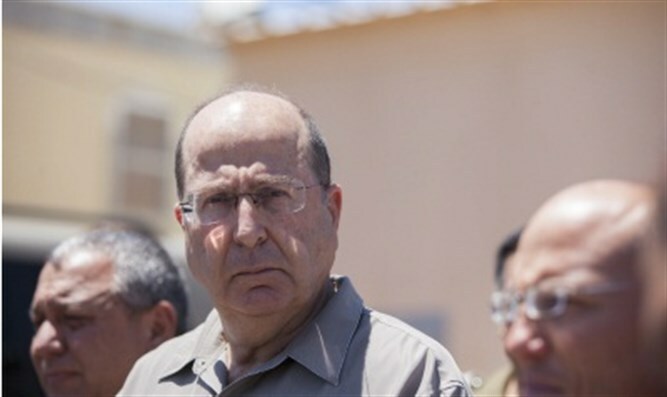 Ya'alon said that he is fielding inquiries from multiple interested parties and said that he is open to running with factions from both sides of the aisle. "There is a big need for mergers," said Ya'alon. "I understand that without it, it's impossible. I am in favor of merging with both right and the left." Upon being queried whether he would fit in with right-wing parties such as Naftali Bennett's New Right, Ya'alon answered that he is "ready to connect anyone who sees our challenges eye to eye with me, certainly on the right, even the New Right". "The important thing is to agree on the internal challenges and oppose hatred." Ya'alon and Bennett have had an adversarial relationship stemming from the then-Defense Minister's handling of 2014's Operation Protective Edge. Protocols from the cabinet meetings showed frequent bickering between the two over the proper course of action. Bennett had lobbied for the IDF to destroy the Hamas terror tunnels, despite the heavy opposition from Ya'alon, who favored conducting the war through air strikes. In Septemeber 2017, Yaalon blamed Bennett for the 2015 'price tag' arson attack in Duma that killed the Dawabshe family. Ya'alon, who was previously a Likud member, served as Defense Minister from 2013 until he was replaced by Yisrael Beytenu leader Avigdor Liberman in 2016, at which time he left the Likud. His relationship with Prime Minister Binyamin Netanyahu has deteriorated since he was forced to leave his ministerial position. Yet on Thursday, Ya'alon said that he has been receiving covert inquiries from the Likud probing the possibility of returning to his old party to become an alternative to Prime Minister Netanyahu. However, reports on Wednesday said that negotiations for a political alliance between Ya'alon and fellow former IDF Chief of Staff Benny Gantz have accelerated over the past few days. According to the report, Ya'alon is expected to receive three of the top ten spots of the list that will run together. If Gantz decides to add other parties to the alliance, the spots reserved for members of Ya’alon’s party will be moved to lower spots on the list. Gantz is also examining the possibility of an alliance with the Gesher party of Orly Levy-Abekasis. At the same time, Ya’alon and his party, Telem, continue to hold talks with the Yesh Atid party headed by Yair Lapid.